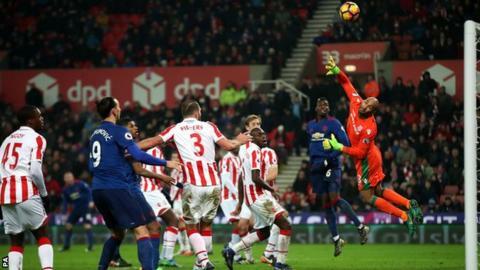 Wayne Rooney became Manchester United's all-time leading goalscorer with a sensational stoppage-time free-kick that rescued a point at Stoke. Stoke looked set for a third straight Premier League win, clinging to a lead given to them when Juan Mata poked Erik Pieters' cross into his own net. United had been frustrated for so long by Stoke's stoic defence and their own wastefulness, and a free-kick awarded just outside the home penalty area looked to be the visitors' last chance as five minutes of added time ticked down. The 31-year-old, who surpassed Charlton's England scoring record in 2015, beat the club mark that had stood since 1973 and gave United a point that looked to have gone. Manchester United captain Wayne Rooney: "It means a hell of a lot. It is a great honour and I am very proud. It is difficult at the minute to be over-pleased because of the result, but in the grand scheme it is huge honour. "It is not something I expected when I joined. I am proud and I hope there is more to come. "The players who have played for this club have been world class." Manchester United manager Jose Mourinho: "The record is the record. It is the record of the biggest club in England and one of the biggest in the world. Before him the record belonged to a legend of English football. Now Wayne becomes a legend of Manchester United." Former record-holder Sir Bobby Charlton: "I would be lying to say that I'm not disappointed to have lost the record. "However, I can honestly say that I'm delighted for Wayne. He deserves his place in the history books. "He is a true great for club and country, and it is fitting that he is now the highest goalscorer for both United and England." Former Manchester United boss Sir Alex Ferguson: "Wayne thoroughly deserves his place in the history books of this great club and I am sure that he will go on to score many more goals. Stoke City manager and former Manchester United striker Mark Hughes: "It is an outstanding record and won't be surpassed. It has taken 40-odd years for Sir Bobby's record to be broken which shows how high a mark it was." This was only Rooney's second Premier League goal of the season after netting on the opening day against Bournemouth. Of his 250 Manchester United goals, this was the 11th that had come in the 90th minute or after and the sixth scored from a direct free-kick. 180 of his goals have come in the Premier League, with 39 in European competition. 136 have been at home, 106 away and eight at neutral venues. He has scored 193 with his right foot, 27 with his left and 30 with his head. Rooney's intervention was all the more dramatic given the struggles of his team-mates on a bitter afternoon in the Potteries. United had almost all of the play - 65% of the possession, 25 efforts on goal to Stoke's six, almost a third of the game was played in City's defensive third - and yet the visitors could barely find a way through. Soon after deflecting into his own net, Mata dinked over from close range with the goal at his mercy, while Grant made excellent saves from Marouane Fellaini and Paul Pogba. Zlatan Ibrahimovic was strangely subdued and on more than one occasion he opted to pass when an effort on goal looked the better option. An isolated figure in the first half, the former Sweden forward gained more support in the second - Marcus Rashford providing pace and incision down the left, fellow substitute Jesse Lingard hitting the top of the crossbar. It all looked to count for nothing until Rooney's late moment of magic gave the visitors a point they totally deserved. Despite the desperate disappointment of seeing victory snatched away, Stoke can take encouragement from further evidence of continued improvement. As recently as 31 December, a five-game winless run had them only seven points above the relegation zone, but they have since won two and drawn one. Conceding 32 in their first 19 matches, they have shipped only two in the past three - and on Saturday keeper Grant's brilliance was matched by Bruno Martins Indi, who put in a colossal performance at the heart of defence. Though attacks were largely limited to counters, Marko Arnautovic created problems down the left and Peter Crouch was a handful for the United defence, despite playing a lone hand up front. A day that began with new signing Saido Berahino being paraded on the pitch ultimately ended with a sucker punch, but realistically Stoke should see this as point gained rather than two dropped. Wayne Rooney will take the headlines, but it was the man he ultimately beat who put in the best performance. Lee Grant seemed unbeatable in the Stoke goal and it took a moment of brilliance - and history - to change that. Stoke City manager Mark Hughes: "We are disappointed but we need to pick ourselves up. We were within seconds of beating a very good Manchester United team. "My only criticism to the guys is that we didn't keep the ball long enough. We are good enough to do that but we needed more care to get up the other end of the pitch. "In the end we tried to protect what we had and I can't criticise what we did for the free kick." Manchester United boss Jose Mourinho: "It was a big game with two teams in the beginning trying to win. But after 25 minutes one team tried to win and the other tried to defend, which they did amazingly well. "They showed great work-rate and did everything to try and stop us. We did everything well except in front of our target. "We missed unbelievable chances. We hit the post, the keeper saves, we missed chances. The opposition goalkeepers are always amazing against us." Out of the FA Cup, Stoke do not play again until 1 February, when they host Everton in the Premier League. United have two games before then, holding a 2-0 lead when they travel to Hull in the second leg of the EFL Cup semi-final on Thursday and entertaining Wigan in the FA Cup on 29 January (16:00 GMT, live on BBC One). Match ends, Stoke City 1, Manchester United 1. Second Half ends, Stoke City 1, Manchester United 1. Attempt missed. Giannelli Imbula (Stoke City) left footed shot from the centre of the box misses to the right. Assisted by Julien Ngoy. Goal! Stoke City 1, Manchester United 1. Wayne Rooney (Manchester United) from a free kick with a right footed shot to the top right corner. Substitution, Stoke City. Giannelli Imbula replaces Marko Arnautovic. Jesse Lingard (Manchester United) hits the bar with a right footed shot from outside the box. Assisted by Zlatan Ibrahimovic. Attempt saved. Paul Pogba (Manchester United) right footed shot from outside the box is saved in the centre of the goal. Assisted by Ander Herrera. Corner, Stoke City. Conceded by Phil Jones. Attempt blocked. Wayne Rooney (Manchester United) right footed shot from outside the box is blocked. Assisted by Paul Pogba. Corner, Manchester United. Conceded by Marko Arnautovic. Attempt missed. Wayne Rooney (Manchester United) header from the centre of the box is too high. Assisted by Jesse Lingard with a headed pass. Attempt saved. Ander Herrera (Manchester United) right footed shot from outside the box is saved in the top centre of the goal. Assisted by Jesse Lingard. Attempt blocked. Daley Blind (Manchester United) left footed shot from the left side of the box is blocked. Assisted by Wayne Rooney with a cross. Attempt missed. Paul Pogba (Manchester United) left footed shot from outside the box is close, but misses to the left. Assisted by Wayne Rooney. Attempt missed. Marcus Rashford (Manchester United) right footed shot from the centre of the box is close, but misses to the right. Attempt blocked. Daley Blind (Manchester United) left footed shot from outside the box is blocked. Assisted by Jesse Lingard. Corner, Manchester United. Conceded by Glenn Whelan. Attempt blocked. Paul Pogba (Manchester United) right footed shot from the centre of the box is blocked. Assisted by Marcus Rashford. Substitution, Stoke City. Julien Ngoy replaces Xherdan Shaqiri. Attempt blocked. Xherdan Shaqiri (Stoke City) left footed shot from the centre of the box is blocked. Assisted by Glen Johnson. Attempt saved. Henrikh Mkhitaryan (Manchester United) right footed shot from the right side of the box is saved in the centre of the goal. Assisted by Paul Pogba with a through ball. Attempt saved. Xherdan Shaqiri (Stoke City) left footed shot from outside the box is saved in the bottom right corner. Substitution, Stoke City. Ibrahim Afellay replaces Charlie Adam. Erik Pieters (Stoke City) has gone down, but that's a dive. Attempt missed. Juan Mata (Manchester United) right footed shot from the centre of the box misses to the right. Assisted by Paul Pogba. Corner, Manchester United. Conceded by Glen Johnson. Lee Grant (Stoke City) is shown the yellow card.